In the spring of 1965, England’s newest hitmakers, the Rolling Stones, embarked on a barnstorming tour of the United States, journeying from coast to coast. The summer of 1965 was full of singles still heard blasting from stereos today -- including "Help Me, Rhonda" by The Beach Boys, "Mr. Tambourine Man" by The Byrds and "I Got You Babe" by Sonny & Cher. 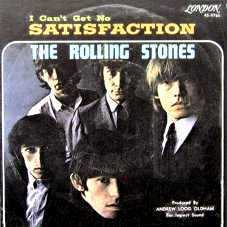 But they all were overshadowed "(I Can't Get No) Satisfaction." The single won a gold record award by the Recording Industry Association of America for selling 500,000 copies, giving the Stones the first of many gold discs in the United States.